Update your home decor with spring prints. 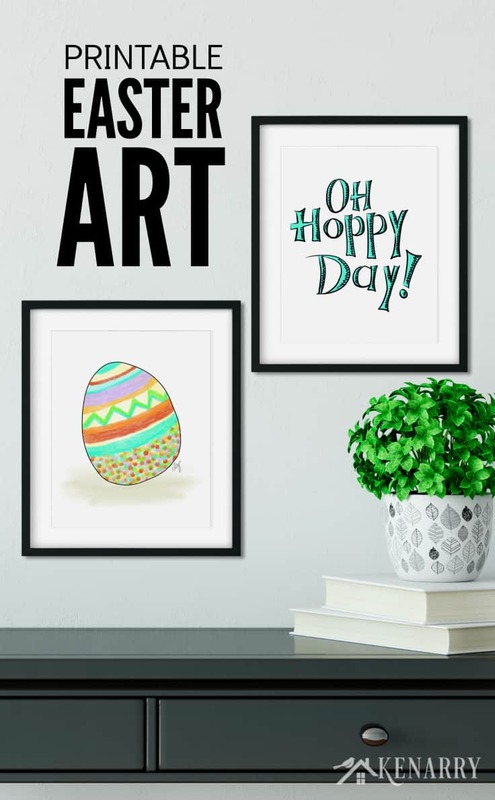 This printable Easter art is available for instant download and features Easter eggs, Easter bunny and chalkboard art. You can quickly and easily update your home decor with affordable spring printables. Starting today, our new collection of Easter art is now available for instant download on Etsy. 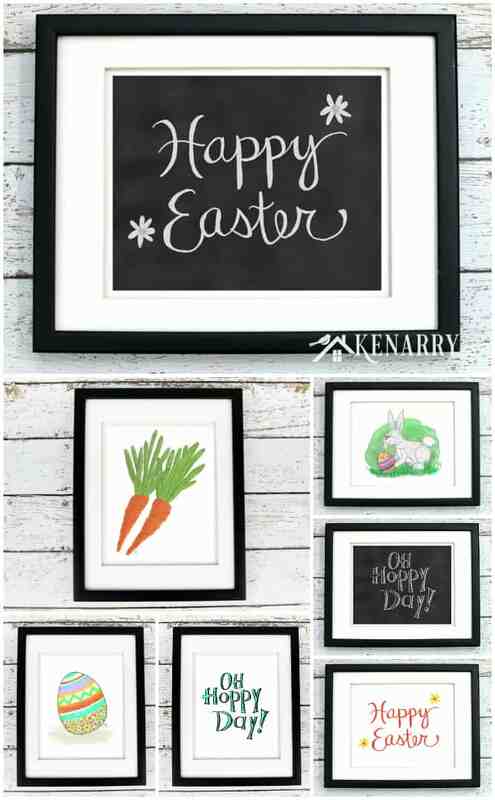 These 8 x 10″ digital prints feature Easter eggs, an Easter bunny and even farmhouse style chalkboard art — all for less than a slice of carrot cake at your favorite bakery! 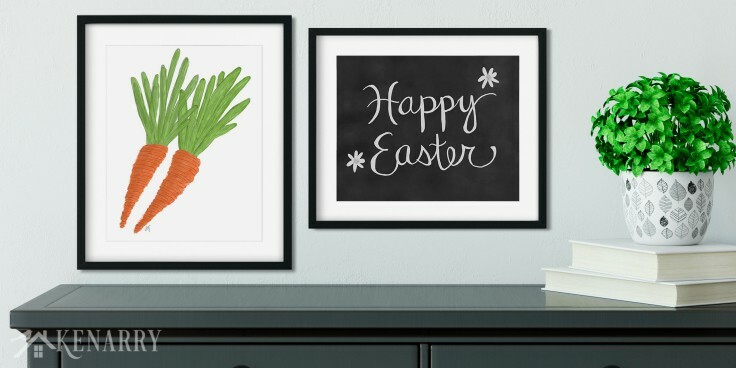 So you want to change out your wall art to coordinate with different holidays throughout the year, like Easter time and the beginning of spring. But money is tight and you’ve only got a small budget to work with. No worries! Instant download prints are your answer! You can get digital art for just a few dollars, so you can afford to change it as often as you want. This is why I personally LOVE printable art. Inexpensive digital prints are an easy way to get new art to decorate the walls of your home on demand. You just buy an empty 8 x 10″ photo frame at any store. Then swap out the picture with new digital art at the beginning of every holiday season. 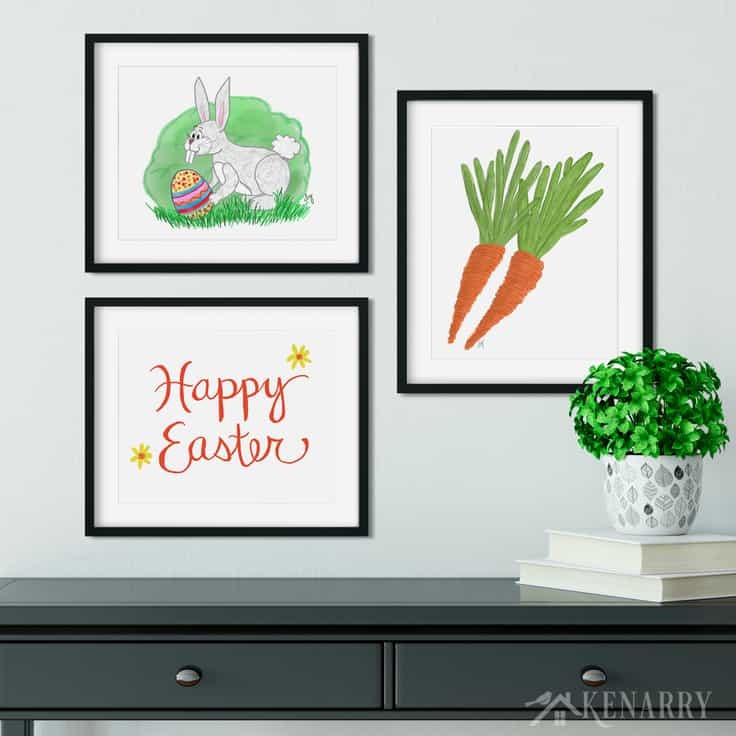 Each of the seven beautiful 8 x 10” prints in this Easter Art Collection is hand drawn digitally. They all showcase whimsical drawings or phrases that I created and hand lettered to celebrate the beginning of spring and Easter time. This printable wall art would look great in a kitchen, dining room, bedroom or living room. Hang them individually or pair them with other art in this collection to create a unique gallery on your wall. Display them throughout the entire spring season or specifically use them as Easter decor. You could even frame any of these instant downloads to use as a gift for a friend or loved one. As a bonus, Kenarry Idea Insiders get 25% off their total purchase from ANY of our digital art collections on Etsy. Look for the sign-up form later in this blog post to get both the special discount code plus access to our exclusive Idea Insider Resource Library. What’s Included With Your Easter Art? A pdf file that you can open using the free Adobe Acrobat Reader. Once you buy the Easter art on Etsy, you will have immediate access to print it now. There’s no need to wait for your new art to be shipped to you. We recommend printing on card stock using your home computer and printer. For best results, you can also take it to a local print shop or online printer. To celebrate the launch of our new Easter Art Collection, these Happy Easter tags are available as a FREE gift when you sign up below! Once you’ve confirmed your e-mail address, we’ll send the free digital printable to you in addition to the coupon code for 25% off any of our digital art or note card collections on Etsy! Plus you’ll have the opportunity to get our weekly Ideas In Your Inbox newsletter as well as access to our resource library stocked with free printables, product discounts and other content that is EXCLUSIVE for Idea Insiders only. 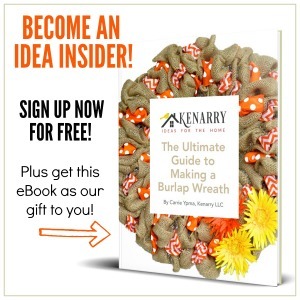 After you sign up to be a Kenarry Idea Insider, you’ll be able to download the PDF file for these Happy Easter tags from the Idea Insider Resource Library. Then just print the tags on white card stock, cut them apart and enjoy! 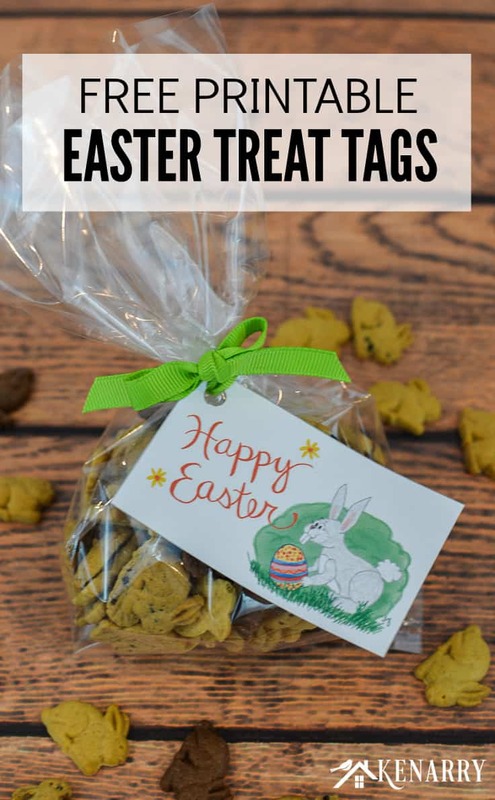 These Easter tags and all printables from Kenarry are for your PERSONAL USE ONLY.